Thank you for your interest in St. Joseph Christian School. SJCS is currently in our 31st year of providing Pre-K through 12 Christian education. We invite you to take a closer look at our well-rounded educational program that strives for excellence in all areas. Selecting the best school for your child(ren) is an important decision and we are honored that you are considering SJCS. Parents today have several educational options available; however, at SJCS, we provide something different, a Christ-centered education experience, empowering students to make an impact in the world for Christ! We have the privilege of teaching the next generation a biblical worldview, ultimately making an eternal impact on our most important treasures – our children! SJCS is committed to partnering with our families, churches, and the community to provide students a wide-range of education, mission and service opportunities based on a biblical worldview. We desire to help students achieve their full potential and have an exceptional staff and highly qualified teachers who love the Lord and teach to the hearts of their students from a biblical worldview. We also have many academic and extra-curricular opportunities available, allowing students to grow in every area of life. If this is the type of education you desire for your child(ren), then we pray that you wholeheartedly and prayerfully pursue partnering with us. The only way to truly know if SJCS is for you, is to experience it! I hope you will make plans today to visit at one or more of our admissions events found on this page. I am here to assist you in the admissions process and can answer any questions you may have. Thank you and I look forward to meeting you! 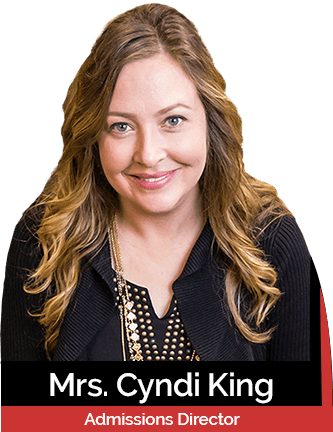 Schedule a tour with Admissions Director Cyndi King. Consider reserving a spot at one of our 2019 Admissions Events!